Christmas is the largest card-sending holiday in the United States with approximately 1.3 billion cards sent annually. 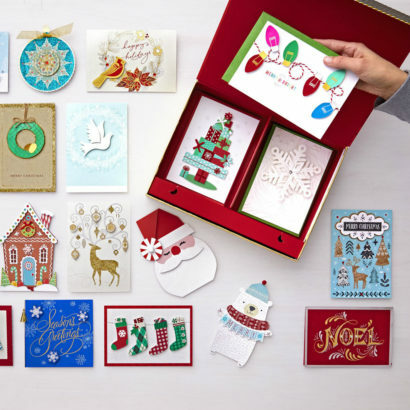 Hallmark provides more than 2,000 Hallmark Christmas card designs, including more than 1,600 individual Christmas cards and more than 325 boxed card designs. According to Hallmark research, nearly three-fourths of consumers who send holiday cards do so because they know how good it feels when they receive a holiday greeting. Hallmark made its first Christmas cards in 1915, five years after the founding of the company. Englishman Henry Cole conceived the idea of Christmas cards in 1843. Too busy to write a personal holiday greeting, Cole hired well-known London artist, John Calcott Horsley, to design a card he could send to all his acquaintances. Louis Prang, a German immigrant, is credited with bringing the idea of Christmas cards to America. In 1875 he printed a card that showed Killarney roses and the words “Merry Christmas”. Available at Hallmark Gold Crown® stores nationwide, online at Hallmark.com, and wherever Hallmark products are sold. Use the store locator on Hallmark.com to find the nearest store.